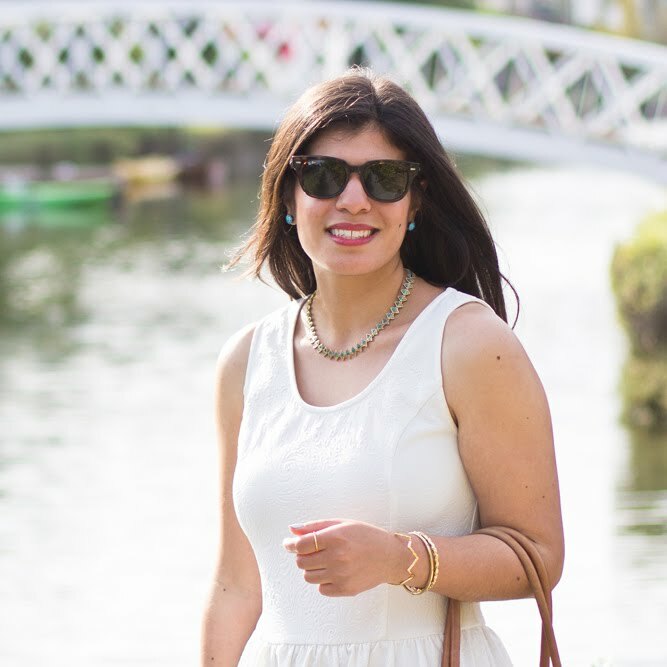 I can't lie, as much as I love winter fashion, I'm with you - at this point in the year, very few new coats or sweaters are making their way into my life, and I find myself out of ideas for how to restyle the ones I already have. I've been contemplating what outfits to photograph this weekend and I'm utterly stumped. Although you may have inspired me to break out my fur vest for another go around. I just love this one on you - the grey shade is really usual but so lovely. I totally agree with you on the winter thing- dressing warmly, yet fashionably can be exhausting! You've done a great job of it though! 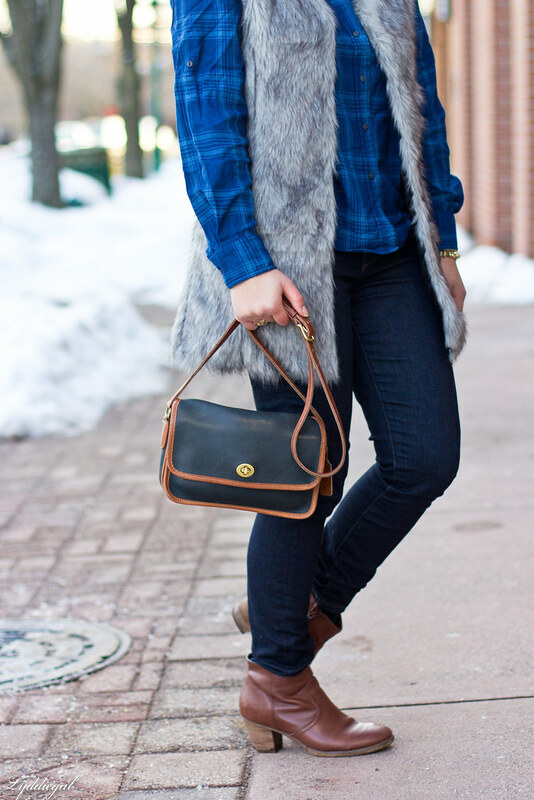 I love the flannel and fur combo in this outfit! Aw happy birthday to your sister! My baby brother is 26 so I know how you feel. Yikes. 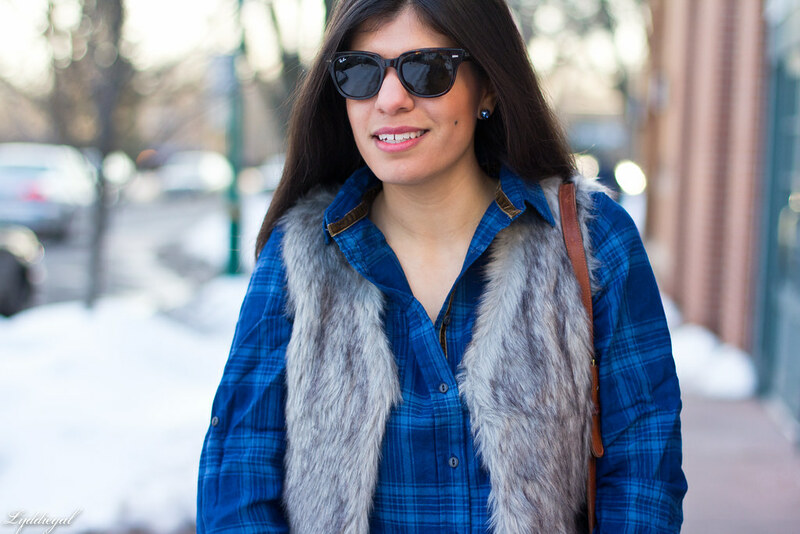 I love this fur vest--I am wearing mine IRL today. Other than my birthday in February, I believe it is the worst month and I am never sad to see it go either. Bring on the spring! 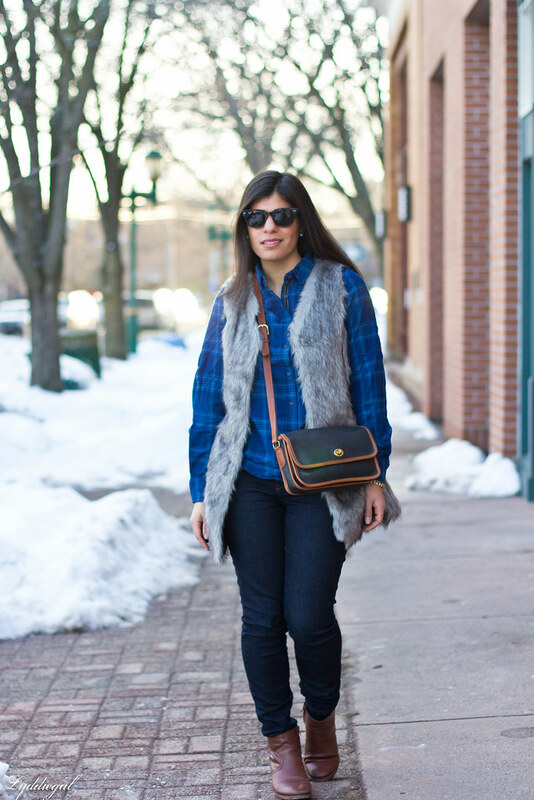 Omgsh as much as I hate this weather and actually all of Feb.--I do love myself some fur :) This vest is just fantastic!! You'll feel old when she turns 30 - trust me. I completely understand what you mean. March means the start of spring and warmer weather to look forward to. I tend to buy more and more sweaters and layers as the winter goes on as well. At this point anything above freezing is good for me! 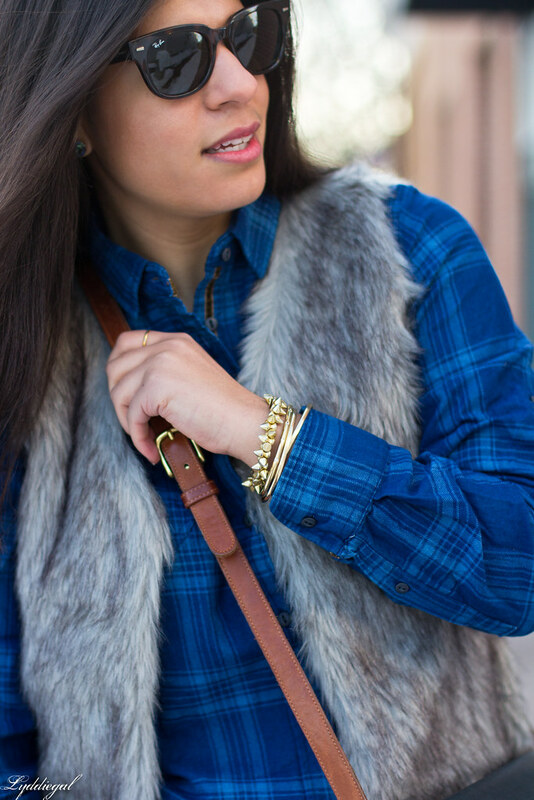 What a great way to style to faux fur!! gorgeous fur vest!! i have yet to own one!! I absolutely hate February soooo much! We are currently blanketed in like five inches of snow too. I want winter over! It seems like winter has gone on forever, doesn't it? Actually, I feel like I don't even know what happened to the past four months, but I looked up today and thought that, you know... isn't winter supposed to be over? Expecting another snowstorm tomorrow, so apparently not. I'm exhausted of this winter, though. I put on bright orange lipstick today and pretended it was spring. 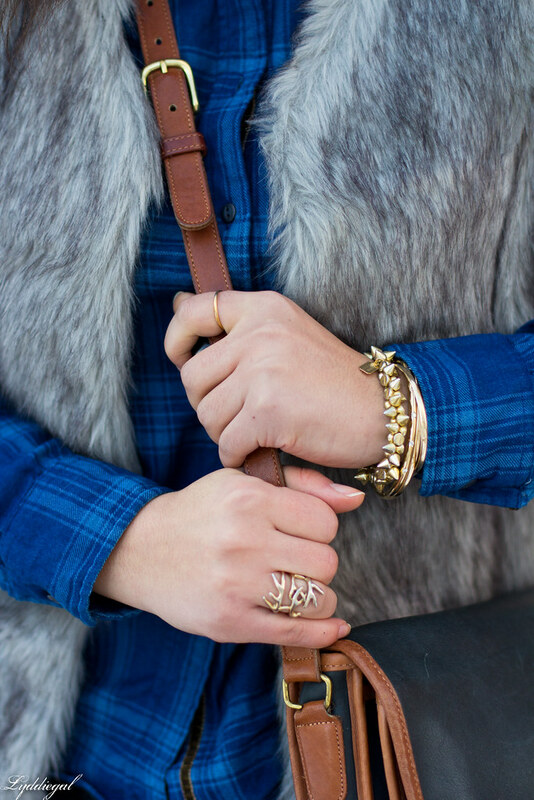 Love the fur with the plaid. Have a great weekend celebrating your little sis birthday! Love the grey fur vest! I'm loving this look!!!!! great vest! Love that fur jacket! I hope you had fun in Boston! I couldn't be happier that it's now March! Hoping this means warmer temps :) I love the color of your vest! Well you can't tell you are getting burnt out on winter, you always look great! 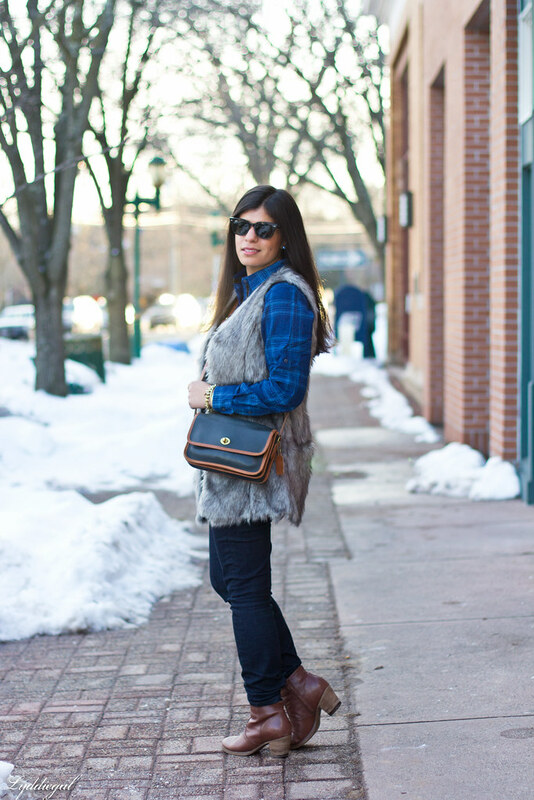 love this faux fur vest on you! such a great piece! 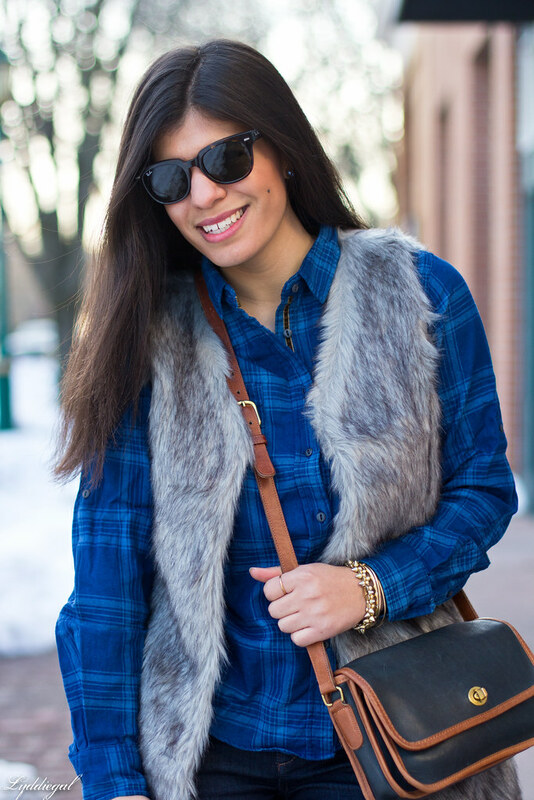 Love the vest with your plaid top! I am so happy to see Feb go....bring on spring! Yep, I agree 100% about February. Won't miss it at all. 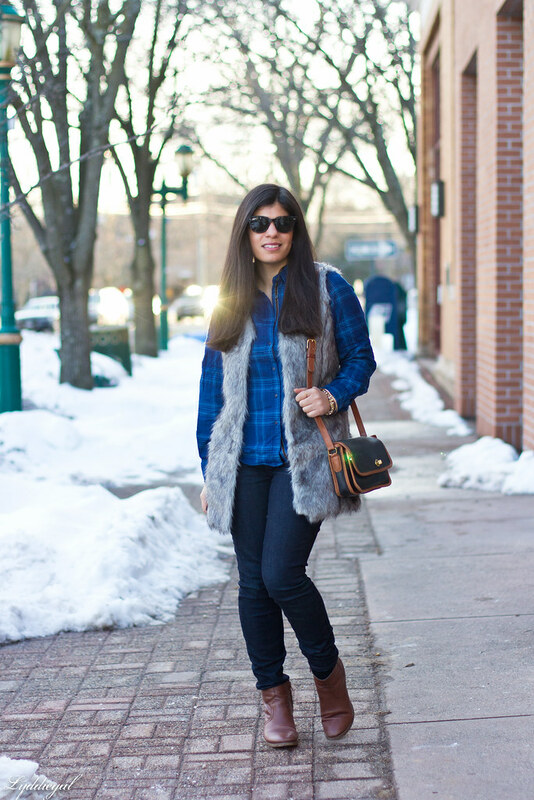 I love the mix of plaid with that furry vest--cozy and cute!